In summer 2017, CDOT and the Federal Highway Administration (FHWA) began phase two of studying and planning improvements on westbound I-70 from Floyd Hill to the Veterans Memorial Tunnels. Among the improvements being considered: increasing travel-time reliability, increasing capacity on the highway, replacing a deficient bridge and improving the geometric design of the interstate. I-70 has two westbound general-purpose lanes for most of the project corridor, with three westbound general-purpose lanes on the eastern end of the project (from approximately MP 246, at Exit 247—top of Floyd Hill/Hyland Hills— to MP 248, east of Exit 248—Beaver Brook). This stretch of I-70 is one of the most congested locations on the westbound I-70 mountain corridor. High-traffic volume on I-70 west of Denver has led to ever-increasing periods of slow traffic, which, at times, approaches a gridlock situation. This area also is heavily impacted by adverse weather conditions. 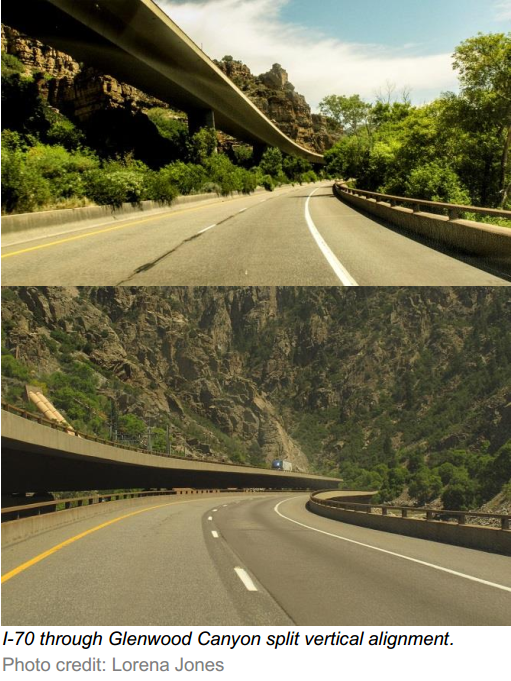 Improvements in this project study area were included as a part of the preferred alternative CDOT selected in the I-70 Mountain Corridor Programmatic Environmental Impact Statement (I-70 PEIS, a tier 1 National Environmental Policy Act (NEPA) process). In 2011, the project team signed a Record of Decision (ROD), which included a decision about capacity, mode, and location for future transportation improvements. From August 2016 to July 2017, CDOT conducted a Concept Development Process, which focused on westbound improvements from the top of Floyd Hill to the interchange of I-70 with US 40 (called Empire Junction). The objective of this process was to develop a shared vision for the corridor among multiple parties. The results of the effort plus the Programmatic EIS are the basis for the tier 2 NEPA process, which began in summer 2017. Through the National Environmental Policy Act process, the project team will study alternatives provided by the I-70 Concept Development Process—conducted by CDOT and I-70 Mountain Corridor stakeholders in winter and spring 2017. All I-70 Mountain Corridor projects include a distinct Context Sensitive Solutions (CSS) process. See the link here. The I-70 Mountain Corridor CSS process designates various groups to work closely with the project team to develop a context statement, core values, critical issues, and evaluation criteria. These groups also review and evaluate alternatives, review environmental impacts, and discuss mitigation. The groups are made up of a Project Leadership Team (PLT), a Technical Team (TT), and Issue Task Forces (ITFs) for special interests such as history, wildlife, water quality and wetlands. The Floyd Hill highway segment is the gateway to the Rocky Mountains from the Denver metro area. Floyd Hill marks a physical transition in both landscape and land use as it rises out of the hustle and bustle of Denver's urban edge and then drops into the quieter, clustered, mountain communities and natural ecosystems of Clear Creek. Floyd Hill is a significant ridge line when traveling west from Denver along I-70, and it is the connection between Jefferson, Gilpin and Clear Creek counties. In addition to being part of a regional transportation network that traverses the Rocky Mountains and supports various recreational, economic, commercial and defense networks, Floyd Hill is also a critical point of access for local community members and residents who rely on this roadway for local travel and connection to other communities—with limited alternative routes available due to the mountainous terrain. Floyd Hill is the entry point to the I-70 Mountain Corridor communities' rich natural and historic heritage and thriving tourist attractions. Visitors from around the world come to recreate in the Arapaho-Roosevelt National Forest, the third busiest national forest in the United States, to experience world-class cycling, hiking, rafting, skiing, hunting, fishing, climbing, and other recreational opportunities in the region. There is a strong desire among Floyd Hill stakeholders to preserve and protect wildlife, habitat and natural features along with the unique small mountain-town aesthetics and historical landmarks. Current Floyd Hill roadway geometry includes steep grades, tight corners, narrow shoulders and limited sight distance. Additionally, Floyd hill presents unique management challenges due to weather-related events, including snow, wind and fog. Highway improvements are needed to facilitate smooth, safe and efficient transportation. The improvements should be designed and constructed in a manner that respects the environmental, historical, community and recreational resources of Floyd Hill. An environmental assessment (EA) process is currently under way pursuant to NEPA, which is a Tier 2 NEPA process. The purpose of the EA is to define the purpose and need for transportation improvements in the project area; to identify alternatives to satisfy the purpose and need; to evaluate the alternatives; and to analyze and document the potential environmental, social, and economic impacts of the reasonable alternative(s). The project advances improvements that were selected in the 2011 ROD. DEFINE THE PURPOSE AND NEED. This step will examine existing and future (year 2040) traffic, future land use plans, roadway deficiencies, travel reliability, freight traffic and other similar problems that a CDOT transportation project can address. This step involves collecting engineering data such as drainage problems; transportation data such as bicycle needs; environmental data such as wildlife usage, historic properties, and neighborhood characteristics; and land use planning information from local jurisdictions. The alternatives being considered are consistent with those in the 2011 ROD. These improvements will add capacity—up to three lanes in each direction. Improvements also include building a bicycle trail and frontage roads from Idaho Springs to US 6. Interchange improvements will be studied at the Beaver Brook exit, the top of Floyd Hill/Hyland Hills, and the bottom of Floyd Hill/US 6. The alternatives that are developed will be subject to an evaluation process to eliminate those that may not be feasible or practical or may have unacceptable environmental impacts. REFINE ALTERNATIVES/IDENTIFY REASONABLE ALTERNATIVES AND/OR A PREFERRED ALTERNATIVE OR PROPOSED ACTION. This task includes developing more detail for a smaller set of alternatives or one proposed action. It includes looking at where bridges might go and what they might look like; where wildlife crossings should be located; if noise mitigation might be needed; what interchange configurations are compatible; and other details. DETERMINE ENVIRONMENTAL IMPACTS AND MITIGATION. This process entails scientific analysis to identify direct, indirect, and cumulative effects to natural resources (wildlife, aquatic resources, wetlands, vegetation, threatened and endangered species, floodplains, water quality); social resources (community cohesion, neighborhoods, individual residences, low-income or minority communities, community facilities); economic resources; and other resources, such as air quality, noise, and farmlands. This step involves preparation of an EA document, allowing 30 days for public review and comment, and holding a public hearing. The purpose of the project is to improve travel time reliability, safety, and mobility, and address the deficient infrastructure on westbound I-70 through the Floyd Hill area of the I-70 Mountain Corridor. 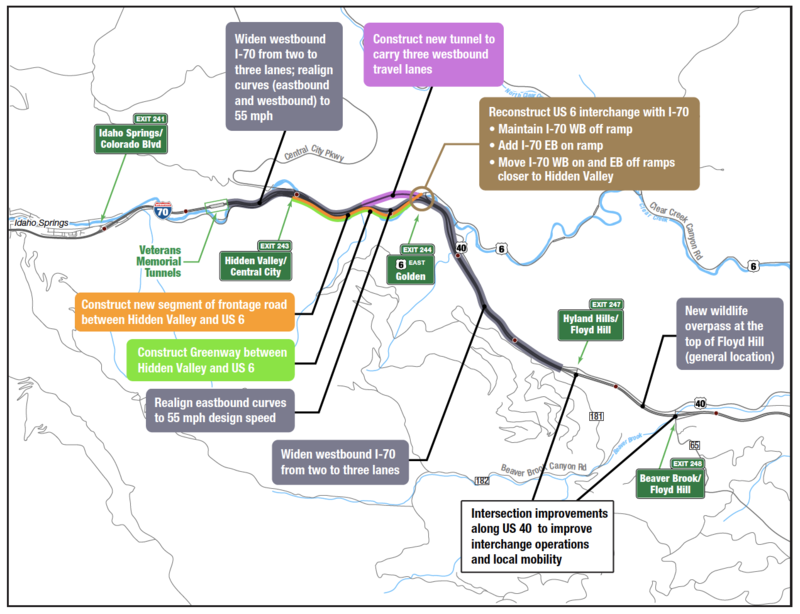 The project advances improvements on the I-70 Mountain Corridor that were identified in the 2011 I-70 Mountain Corridor Record of Decision (ROD). An additional purpose to the project is to address tight horizontal curves on eastbound I-70 causing safety concerns. This project also addresses two improvements included in the ROD from US 6 to Hidden Valley and Hidden Valley to Idaho Springs. The purpose of these improvements is to improve multimodal connectivity and to provide an alternate route parallel to the interstate mainline in case of emergency or severe weather conditions. The project purpose and specific needs form the basis for developing and evaluating alternative transportation solutions, as they are measurable and apply throughout the corridor. The Floyd Hill section of the I-70 Mountain Corridor is part of a regional transportation network that supports recreational, economic, commercial and defense networks. It is also a critical point of access for local community members and residents who rely on this roadway for local travel and connections to other communities, with limited alternative routes available due to the mountainous terrain. Improvements in this section are planned to respect the environmental, historical, community and recreational resources. Opportunities to enhance or restore these resources will be sought.